The Kansas City Royals' crown logo looms high above Kaufman Stadium—standing more than 100" feet tall—in the form of one of the most recognizable scoreboards in American professional sports. Royals fans, along with millions of baseball fans all over the world, will be constantly reminded of the team's emblem next week as Kansas City hosts its first World Series in 29 years. 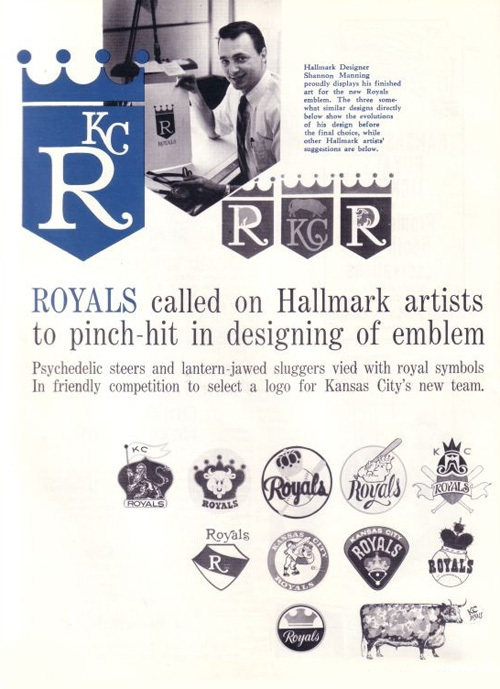 The visual identity of the Royals has remained remarkably consistent since the franchise played its first game in 1969. From the "KC" featured on team caps to the script lettering on the home uniforms, the look of the 2014 World Series Royals bears a very close resemblance to that of their ancestors of 45 years ago. The winning artist was Shannon Manning—a White Sox fan at the time. A package designer at Hallmark, Manning's now-familiar crown logo embraced the dominant corporate branding style of the late '60s—a relatively simple visual featuring minimal typography, enclosed within a bold, graphic geometric shape. Contemporary and striking (especially in the context of the world of sports identity at the time,) Manning's work holds up remarkably well today. Last spring, Ewing Kaufman, owner of the American League expansion club, and general manager Cedric Tallis, asked Hallmark to design the emblem and logo for the team—it will appear on uniforms, jackets, stationery and promotional items. Hallmark assigned 15 artists to the project. The winner was Manning's design featuring a white "R" and a smaller gold "KC" on a royal blue shield topped by a four-pointed gold crown. The word "Royals" in gold lettering appears below the shield. It wasn't easy, however. After the 15 artists submitted their ideas in April, three—Manning, Carl Woods and Peter Smokoroski—were asked to submit variations of their original designs. After studying the second efforts, the Kaufmans decided to go with Manning. Manning never varied from the basic "R" on the royal blue shield topped by the gold crown. His experimentation came into play on the placement of "KC" and what to do about the loop on the "R."
His first entry omitted the "KC" and used a red stylized head of a stallion inside the loop. Later, he added "KC" in the upper right-hand corner of the blue shield and put the head of a steer inside the loop. Another version had a steer above the "R" . The loop at various times contained home plate, a baseball and a regal symbol. But simplicity won out and the Kaufmans selected the "R" with the empty loop. Manning went on to say that "I wanted a design that was appropriate to the times. We have a 1969 ball club so I wanted to give it a 1969 emblem." His original logo has evolved over the years, with "KC" taking over as the focal point of the identity in 2002. The core of the 1969 emblem has remained intact, testament to the solid foundation that he provided nearly half a century ago. The Royals' uniforms were introduced in February 1969. Taking their cue from Manning's primary logo, the club's simple, classy, and classic on-field look has similarly evolved over the past 45 years. The Kansas City Royals, their fans, and their iconic team identity will be featured on baseball's biggest stage for the first time in decades next week, classy, crowned, and (thankfully) free of bovine imagery.